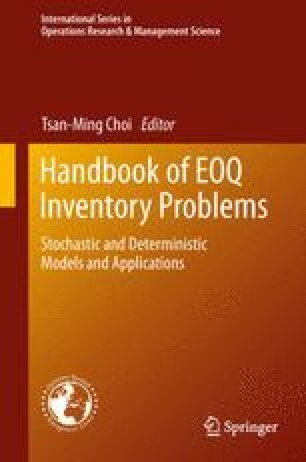 The EOQ mathematical models usually deal with the problem of a wholesaler who has to manage a goods restocking policy, settling his best amount of goods to be procured. Best means capable of minimizing all the costs concerning the trade of the stored goods. The relevant seminal contributions are due to Harris, and Wilson, who analyzed an easy scenario with a certain demand uniform all over the time so that its instantaneous change rate is fixed, with stocking charges not dependent on time. In such a field, our own contribution consists of establishing sufficient conditions on the well posedness to the minimum cost problem and relationships providing either closed form solutions or, alternatively, quadrature formulae—without ex ante approximations. All this allows a numerical solution to the transcendental (or algebraical of high degree) equation solving to the most economical batch. In short, such our paper is concerning the special family of EOQ mathematical models with different deterministic time-dependent demands. We wish to thank the anonymous Referees and the Editor for their fruitful suggestions which improved our article.